John O’Neill still plays the same drum set his mom bought him when he was 12 years old. Music has been a love of his since early childhood, starting with violin then moving to piano and eventually adding percussion. John studied classical percussion at Indiana University with the late George Gaber, which culminated in a gig playing triangle at the United Nations with the Tokyo Symphony. Basically, it took four years of playing classical percussion to realize he did not want to be a classical percussionist! However, while in Indiana John was able to study drum set with Kenny Aronoff who at the time was the drummer for John Mellencamp. These two years simplified his drumming and got him concentrating on “the groove” instead of fills and drum solos. 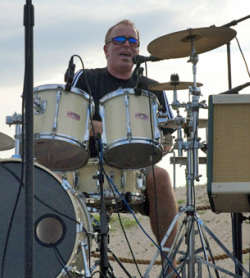 In the 90’s, John played and sang with a number of original bands including Chicago bands The Bottles and Glencolumbkill, and Richmond-based Left Exit, which toured and played warm up spots for up and coming bands such as Phish, Blues Traveler, The Subdudes, and Widespread Panic. In 1998, John composed the original score for the film “The McCourts of Limerick,” a Cinemax film based on the life of Pulitzer Prize winning author of “Angela’s Ashes” Frank McCourt. In the 2000’s, John got the reggae bug playing and recording albums with Barry & the Penetrators and Predator Dub Assassins. The Haven has been a welcome introduction into the world of the infamous New Jersey cover band scene with great potential for original recordings. A multi-instrumentalist, John’s day gig is spent sharing his love of music and preparing young wind and percussion players in the Long Branch school district.